Some of the most interesting characteristics of the new designs are that they are engineered to use spent nuclear fuel. Brinton estimates that over time, if even just eight of the 33 designs listed in the report make it to market, their life cycle demand for spent nuclear fuel could add up to as much as 25% of the current US inventory. A few designs propose to use thorium as a fuel. Another feature is that coolants run the gamut including liquid metal, high temperature gases, and molten salt. Here’s a brief run down of the 33 firms profiled in the Third Way report by type. Readers will note there is overlap among the types. This is the classification used in the Third Way report. The report also discusses work on fusion reactors, but that aspect of it isn’t addressed here. Innovative reactor designs by type. Graphic courtesy of Third Way. There are two “tipping points” for success Brinton said. 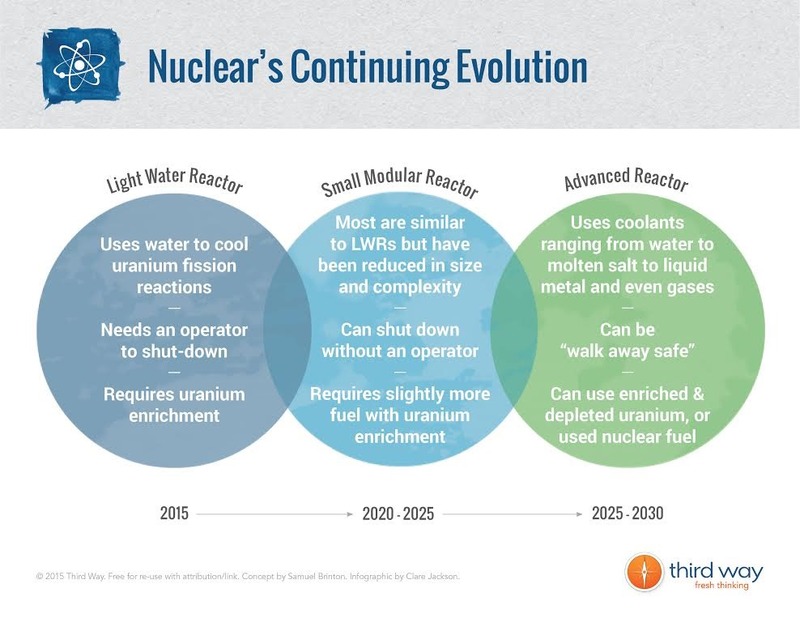 The first is that everyone working in these advanced designs is watching to see how the US Nuclear Regulatory Commission (NRC) deals with the first design review and license for a small modular reactor (SMR). These are light water reactor designs which is what the NRC knows best. One of the key safety issues which stand out is whether a single control room can be used to manage multiple small units. NuScale, which is developing a 50 MW SMR, has announced it will submit its design to the NRC by the end of 2016, and that its first customer, UAMPS, will submit a license application once the design review gets the NRC’s approval. The agency has pledged to complete the design review in about 36 months. The NuScale SMR is based on well-understood light water reactor design principles. 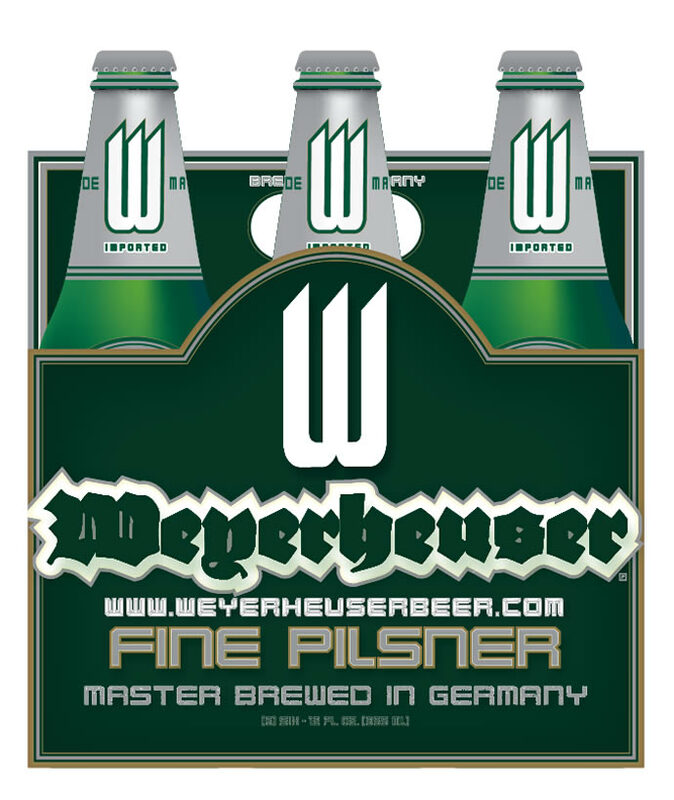 What makes the project different is that the firm wants to sell its reactors like beer – in six packs. A mature installation would have 12 50 MW reactors built over time with the revenue from the first unit paying for the second, and so on. While there is a competitive advantage for whomever comes second after NuScale, the second tipping point isn’t a regulatory hurdle. It is the vendor who fills an order book with enough customers to raise the money to build a factory to fabricate SMRs either of light water design, or innovative technology, and reap competitive savings from a production line. An SMR is loosely defined as having an electrical power output of less than 300 MW. That doesn’t imply that the larger designs, like Terrapower, don’t have an equal chance of commercial success. One of the success factors for advanced nuclear reactor designs is that they differentiate themselves in terms of how they are used. The Third Way report notes that some of these applications include providing dependable power in remote areas, process heat for industrial use, and electrical power for desalinization using remote osmosis processes. All of the designs hold a promise to reduce proliferation concerns, especially those that use spent fuel. The report also points out that SMRs, regardless of technology basis, are candidates to replace coal-fired boilers at existing power plants since the rest of the infrastructure could be reused. Information on the estimated costs to build these advanced designs isn’t readily available, but Brinton says that the first of a kind units aren’t likely to be less costly per kWe than their conventional 1000 MW cousins. The global market average is running at around $4,000/kWe. It is higher in some countries like the UK and lower in others like China. Time to build the innovative units depends greatly on whether each unit is a custom job or whether the vendor can justify investment in a factory. There is more to just time to market and the other competitive issues associated with bringing first of a kind designs to commercial fruition. Brinton is passionate on the point that while businesses will always compete, he feels the advanced nuclear reactor businesses cited in the Third Way report need to see themselves as a community. What’s next for the Third Way’s energy program? Brinton said that he wants to address the challenges developers face in proving their technologies include getting access to test facilities. It is not easy or economical to do so right now he says. Another issue is that some vendors have no interest in developing their products for US markets. The reason is the NRC simply isn’t ready to do safety reviews for advanced designs. In fact, the agency is realigning its workforce and may, in future years, be smaller in terms of full time civil servants, than it is today. Without expertise or guidelines to address a safety review of an advanced reactor design, the developers, like Terrapower in China, are likely to seek success in other countries. The US will be poorer for it if it cannot capture the value these entrepreneurs are working to create. Brinton and his colleagues at the Third Way are looking for answers to these issues. Postscript: Readers may also be interested in a report published in Fortune Magazine titled, “Why startups can save nuclear tech” on July 6th.